It’s well-known that keeping your mind active is good for your brain, but a recent study shows that keeping your body active is important for brain health, as well. 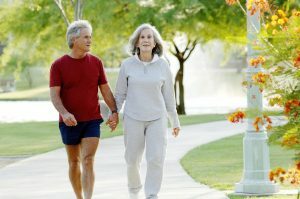 The study, published in the Journal of Alzheimer’s Disease, shows that seniors who engage in moderate exercise for just over an hour a day, show significant improvement in the way certain regions of their brains metabolize glucose. And those regions are the ones that count when it comes Alzheimer’s: decreased metabolism of glucose in those regions has been associated with higher incidence of Alzheimer’s Disease. Fine, you say, but what does “moderate” mean? Not as much as you might think: just the equivalent of a brisk walk. Interestingly, more isn’t merrier: vigorous exercise, like aerobics, has not been shown to offer this benefit. Vigorous exercise affects glucose metabolism in just one area of the brain, and light exercise, like taking a stroll, has not been shown to have any effect at all. The study participants, whose ages ranged from 58-70, were all cognitively healthy but had at least one risk factor for Alzheimer’s: either a family history of the disease, at least one genetic mutation associated with the disease, or both, so this finding offers incentive, especially for those at risk of AD. Now that spring has finally sprung, be sure to take some time out for a nice brisk walk or some other form of moderate exercise. Your brain will thank you! One way to make it easier to get moderate exercise is to live somewhere that encourages it. For example, Hamilton Grove Healthcare and Rehabilitation Center, conveniently located in the Trenton area, is situated on beautifully landscaped grounds, which make taking a daily walk a pleasant experience. At Hamilton Grove, we have created an environment and program that truly enhances quality of life, thus promoting recuperation, health, and well-being. Our talented and creative recreation department provides a broad variety of stimulating and engaging activity options, including gardening, exercise, outdoor walks, day trips, as well as crafts, intellectual pursuits, drama, hands-on pets, and many, many other activities and programs. Does your loved one already suffer from mental decline? Being in a residence with a dedicated Alzheimer’s unit is especially important.